What Does the Bible Say About Keeping Vows? If you said you would do it, you made a promise – you made a vow. Are you faithful to keep that vow? As humans it is so easy to break it, don’t you agree? 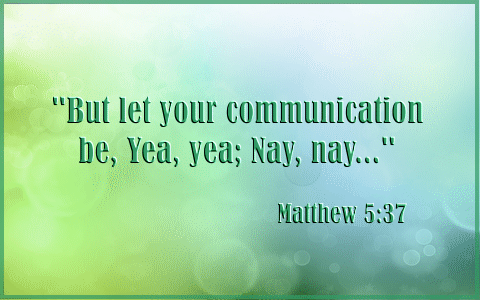 Jesus said “But let your communication be, Yea, yea; Nay, nay: for whatsoever is more than these cometh of evil.” (Matthew 5:37) From His words, I think we can see that when we break a vow it is never good. Let’s see what else the Bible has to say about keeping vows. Exodus 24:7 And he [Moses] took the book of the covenant, and read in the audience of the people: and they said, All that the LORD hath said will we do, and be obedient. Numbers 30:2 If a man vow a vow unto the LORD, or swear an oath to bind his soul with a bond; he shall not break his word, he shall do according to all that proceedeth out of his mouth. Deuteronomy 23:21–23 When thou shalt vow a vow unto the LORD thy God, thou shalt not slack to pay it: for the LORD thy God will surely require it of thee; and it would be sin in thee. But if thou shalt forbear to vow, it shall be no sin in thee. That which is gone out of thy lips thou shalt keep and perform; even a freewill offering, according as thou hast vowed unto the LORD thy God, which thou hast promised with thy mouth. Ecclesiastes 5:4–5 When thou vowest a vow unto God, defer not to pay it; for he hath no pleasure in fools: pay that which thou hast vowed. Better is it that thou shouldest not vow, than that thou shouldest vow and not pay. Genesis 21:27 And Abraham took sheep and oxen, and gave them unto Abimelech; and both of them made a covenant. 1 Kings 5:12 And the LORD gave Solomon wisdom, as he promised him: and there was peace between Hiram and Solomon; and they two made a league together. 1 Kings 20:34 And Ben-hadad said unto him, The cities, which my father took from thy father, I will restore; and thou shalt make streets for thee in Damascus, as my father made in Samaria. Then said Ahab, I will send thee away with this covenant. So he made a covenant with him, and sent him away. Genesis 9:16 And the bow shall be in the cloud; and I will look upon it, that I may remember the everlasting covenant between God and every living creature of all flesh that is upon the earth. Hebrews 13:20–21 Now the God of peace, that brought again from the dead our Lord Jesus, that great shepherd of the sheep, through the blood of the everlasting covenant, Make you perfect in every good work to do his will, working in you that which is wellpleasing in his sight, through Jesus Christ; to whom be glory for ever and ever. Amen. Jeremiah 31:31–33 Behold, the days come, saith the LORD, That I will make a new covenant With the house of Israel, and with the house of Judah: Not according to the covenant that I made with their fathers In the day that I took them by the hand To bring them out of the land of Egypt; Which my covenant they brake, Although I was an husband unto them, saith the LORD: But this shall be the covenant that I will make with the house of Israel; After those days, saith the LORD, I will put my law in their inward parts, And write it in their hearts; And will be their God, And they shall be my people. Hebrews 8:10–11 For this is the covenant that I will make with the house of Israel after those days, saith the Lord; I will put my laws into their mind, and write them in their hearts: and I will be to them a God, and they shall be to me a people: And they shall not teach every man his neighbour, and every man his brother, saying, Know the Lord: for all shall know me, from the least to the greatest. Genesis 28:20–22 And Jacob vowed a vow, saying, If God will be with me, and will keep me in this way that I go, and will give me bread to eat, and raiment to put on, So that I come again to my father’s house in peace; then shall the LORD be my God: And this stone, which I have set for a pillar, shall be God’s house: and of all that thou shalt give me I will surely give the tenth unto thee. Judges 11:30–31 And Jephthah vowed a vow unto the LORD, and said, If thou shalt without fail deliver the children of Ammon into mine hands, Then it shall be, that whatsoever cometh forth of the doors of my house to meet me, when I return in peace from the children of Ammon, shall surely be the LORD’s, and I will offer it up for a burnt offering. 1 Samuel 1:11 And she vowed a vow, and said, O LORD of hosts, if thou wilt indeed look on the affliction of thine handmaid, and remember me, and not forget thine handmaid, but wilt give unto thine handmaid a man child, then I will give him unto the LORD all the days of his life, and there shall no rasor come upon his head. Jonah 1:14–16 Wherefore they cried unto the LORD, and said, We beseech thee, O LORD, we beseech thee, let us not perish for this man’s life, and lay not upon us innocent blood: for thou, O LORD, hast done as it pleased thee. So they took up Jonah, and cast him forth into the sea: and the sea ceased from her raging. Then the men feared the LORD exceedingly, and offered a sacrifice unto the LORD, and made vows. No doubt, for as long as we live on earth, we will make vows. Let it be our heart’s desire to keep the vows that we make. When we say “Yes” let us mean “Yes” and when we say “No” let us mean “No”. Though it be challenging as humans, we can succeed through the power of the Holy Spirit to do “whatsoever things are true, whatsoever things are honest” (Phil 4:8). Read about one of God’s everlasting covenants here: What is the Abrahamic Covenant? Previous post: Who Was Apollos? Next post: Do The Jews Believe In An Eternal Hell?